By developing elearning for inductions / onboarding, we’ve helped a range companies and organisations to reduce time to competency, improve compliance and trim costs. Read our case study on the impact and ROI delivered for Lloyds Business Banking. Reduced onboarding attrition from 20% to 5%, cut after-call work time by over 50%, and complete ROI within just 3 months… See how we made a hugely positive impact with corporate elearning for Lloyds Business Banking using scenario and simulation-based training solutions. The ins and outs of business banking can be pretty tricky to get your head around, and when it’s accompanied by golden oldie computer systems and humdrum training, it’s hardly surprising that new recruits run for the hills. It’s no wonder then that Lloyds Business Banking was finding it rather challenging to get its freshers excited enough about taking calls from its business customers to complete their training, and take up their contact centre jobs after the 12 week induction period. Recruiting and training people for banking jobs is an expensive business and with one in 5 recruits dropping out before finishing their training, Lloyds Business Banking needed to rethink its approach to teaching call centre staff. Its existing training wasn’t particularly well structured and didn’t allow trainers enough time to support learners or go through the really hard stuff in more detail. That and it was all just lacking a bit of oomph to get trainees excited. So, Lloyds approached Day One to see if we could spice up their learn life. 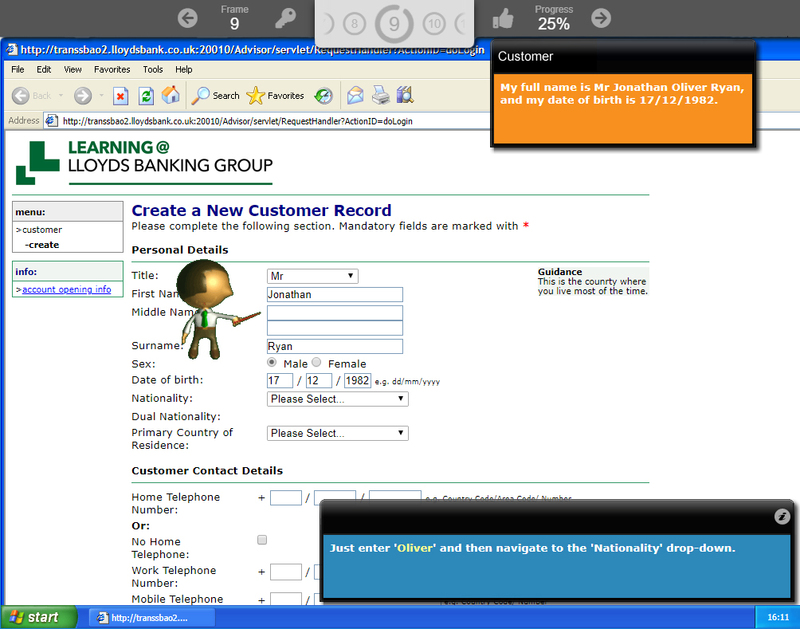 Day One came up with a modern corporate elearning solution which would move Lloyds Business Banking away from a ‘death by PowerPoint’ approach to learning their systems and processes, and give learners a real taste of the work they would be doing with customers. We created a simulated environment for trainees to practise real life situations, using mocked up versions of Lloyds’ desktop systems and an endless choice of training scenarios (thanks to our Dynamic Data™). This provided a safe place for learners to practice the complex processes required for business banking before they were let loose on actual customers. A major advantage of approaching the training in this way is that while learners beaver away on their elearning modules, getting really familiar with the systems and processes, the Lloyds trainers are free to work the training room, supporting those who are struggling and explaining the tricky bits in more detail. As the simulated systems were created on Day One’s learning management system, we built in assessment functions so that trainers could accurately measure how their recruits were getting on and could identify anyone needing extra support earlier. Before they got overwhelmed and ran for the hills faster than the Brownlee brothers! They must have been pleased with us, because Lloyds then asked us to look at elearning support for the mainline operations of their business banking staff! Nothing says ‘we love your work’ more than ‘come and do some more’. “A critical success factor for us was to ensure we had new colleagues who were competent in the use of the systems when they left their learning event. A key enabler of this was the ‘Day One’ system. Whatever your training requirements, the Day One can deliver on them with a bespoke solution. See how we develop finance elearning content.